League Two leaders Lincoln City became the first club to win promotion in the English Football League this season after drawing with Cheltenham Town. 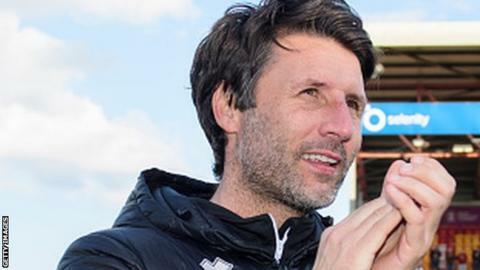 Boss Danny Cowley has now guided the Sincil Bank side to two promotions in his three seasons at the club, as well as winning the Checkatrade Trophy at Wembley last season. The 40-year-old told BBC Radio Lincolnshire promotion to League One was "a lifetime's work". Shay McCartan gave the hosts the lead with a powerful shot that beat Robins goalkeeper Scott Flinders at his near post. George Lloyd headed in a Chris Hussey cross to level for the visitors, but Mansfield's draw at Northampton and MK Dons' defeat at Tranmere meant a point was enough for Lincoln. "We're obviously delighted to have won promotion. I've been sick and tired of having that conversation all week with people, (having to say) 'We haven't done it yet we've still got a bit to do.'" said Cowley. "For us to beat the club record of 19 games unbeaten and get promoted, it's been a project all season we've been working towards but ultimately it's been a lifetime's work." Lincoln's rise under Cowley and his sibling assistant Nicky has resulted in rapid, consistent improvement with the club playing in the National League as recent as 2017. "League One was a million miles away not so long ago," Cowley added. "It was three years ago in May that we came here. We've come a long way in a short space of time, the great thing about success is that it creates further opportunities for other successes. "The most imminent [target] is to try to win the league now. "All season it has been about getting promotion but once we've got promotion we're always going to redefine the objectives so now it is to win the league. We've been top all year so we feel like we deserve it." The Imps, who have not played in the third tier of English football since 1999, now need just three points from their remaining four games to secure the title. But Cowley has said his players "are under no illusions" and are aware of a "big gap" in quality between the third and fourth tier. "You've only got to look at Sunderland, who spent £4m on a centre-forward this season," he added. "But you've got to be in it to win it. We're only one division away from the Championship now."